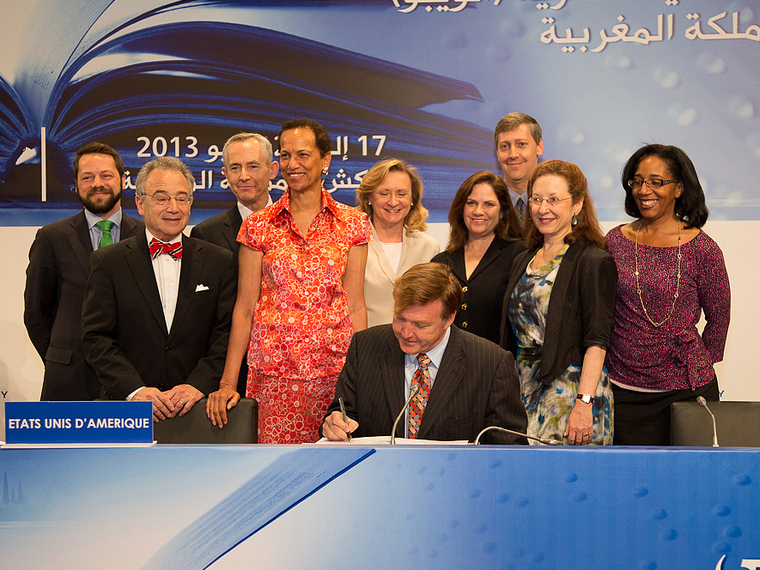 Washington, DC—The Institute of Museum and Library Services is pleased to announce that the United States has joined the Marrakesh Treaty as its 50th member, partnering with 78 countries, including the 28-member European Union, to increase the worldwide availability of books and other reading materials in accessible formats. Today, the U.S. officially deposited its instrument of ratification of the Marrakesh Treaty to Facilitate Access to Published Works for Persons Who Are Blind, Visually Impaired or Otherwise Print Disabled with the World Intellectual Property Organization in Geneva, Switzerland. The treaty facilitates the production and cross-border exchange of books in accessible formats for people who are blind, visually impaired, or have other print disabilities, such as physical limitations affecting their ability to hold a book. In addition to requiring its members to have copyright exceptions to make accessible format copies of published works, the Marrakesh Treaty enables libraries that are authorized entities to make accessible copies of textual materials and books for people with print disabilities, including those who live outside the United States. “The Institute of Museum and Library Services is pleased to welcome the United States’ implementation of the historic agreement reached in Marrakesh,” said IMLS Director Dr. Kathryn K. Matthew. “Joining this treaty will greatly increase the capacity of libraries and other institutions serving individuals with print disabilities to provide access to published materials from throughout the world. Access to information is essential to our society, and critical in helping all individuals to fully engage with their communities." The impact of the Marrakesh Treaty will be critically important in reducing the global shortage of print materials in accessible formats. Even within the United States, fewer than 5% of published works are accessible. The American public will greatly benefit by gaining access to works published abroad in accessible formats, in a variety of languages. IMLS is charged by law with expanding access to library and information services for individuals with disabilities, and has incorporated this into the agency Strategic Plan 2018-2022, Transforming Communities. IMLS supports libraries, including the State Library Administrative Agencies and State Libraries for the Blind, to achieve this key objective. IMLS has worked with other leading U.S. agencies since 2009 to draft this historic multilateral treaty, which was adopted by the international community in Morocco on June 27, 2013, and came into force on September 30, 2016. In June 2018, the U.S. Senate approved ratification of the treaty and the full Congress enacted implementing legislation by the end of September. President Donald J. Trump signed the Marrakesh Treaty Implementation Act into law on October 10, 2018, and the documents to ratify the treaty on January 28, 2019. The Marrakesh Treaty now will enter into force for the United States in 90 days. “This groundbreaking treaty, which requires member nations to create exceptions and limitations to copyright law and provides a framework for exchanging accessible materials across borders, will help people who are blind, visually impaired, or otherwise print disabled, wherever located, to access and participate in our cultural, scientific, and knowledge society,” said IMLS General Counsel Nancy E. Weiss. For more information, please visit the IMLS website at www.imls.gov. More information is also available through the U.S. Copyright Office.